Houston Review, issue from fall 1980. Image available on the Internet and included in accordance with Title 17 U.S.C. Section 107. HOUSTON REVIEW. 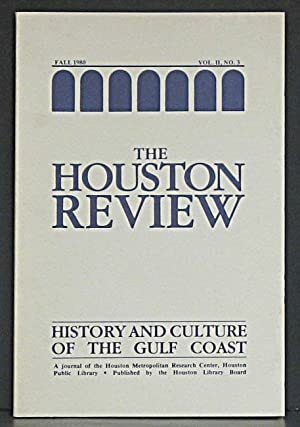 The Houston Review, published three times a year, was founded in the spring of 1979 by the Houston Metropolitan Research Center and published by the Houston Public Library Board. The periodical, which focuses on the history and culture of the Gulf Coast, was first edited by James M. Poteet. Handbook of Texas Online, Diana J. Kleiner, "HOUSTON REVIEW," accessed April 23, 2019, http://www.tshaonline.org/handbook/online/articles/eeh08.